Dubai: It was in early March last year when Indian speedster Mohammad Shami’s world suddenly came crashing down after his wife Hasin Jahan heaped damning allegations about his personal life. In less than a year, the spring is back in his step and he is back to doing the job he knows best — picking up wickets. 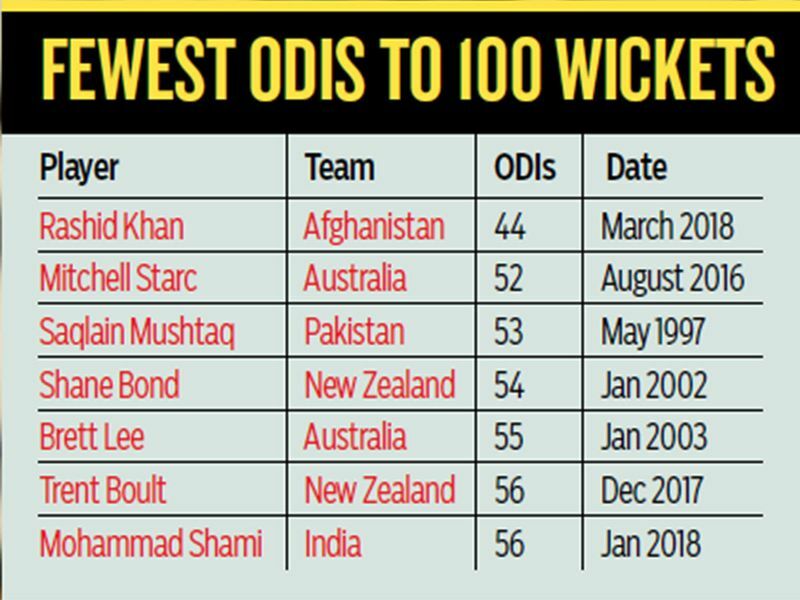 When India began their One-day series against New Zealand with a big win at Napier last week, Shami reached the landmark of being the fastest Indian bowler to reach 100 One-day International (ODI) wickets in 56 games — beating Irfan Pathan’s record of 59 matches. Also left trailing in his wake were bigger names in Indian cricket — names such as Zaheer Khan (65 matches), Ajit Agarkar (67) and Javagal Srinath (68). Shami is now tied with New Zealand pacer Trent Boult as the sixth fastest to the 100-wicket landmark in terms of matches played. There were tell-tale signs of Shami emerging stronger during India’s historic Test series win against Australia in which he picked up 16 wickets from four Tests — and formed a formidable strike force with Jasprit Bumrah and Ishant Sharma. He has gone on to maintain the consistency with a haul of seven wickets from the three ODIs so far in New Zealand — with his three for 41 earning him the Man of the Match in the last game that India won to take an unbeatable 3-0 lead in the series. The fourth one-dayer is scheduled in Hamilton on Thursday. With barely three months left before the ICC World Cup, Shami has forced himself back into the reckoning to take the flight to England for the showpiece — something which had looked like a long shot last year when his career was down in the dumps. Hasin, his wife of four years, labelled him as a serial womaniser and accused the family of trying to murder her — in addition to insinuating that he had also been complicit in fixing matches. “It has been a long journey, especially when I played [the] World Cup. It took me two years to recover from injury. After long process, I gained confidence and performed better. I’ll continue to perform this way,” said a solemn looking Shami at the Napier press conference. It had, indeed, been a “long journey” for Shami — who has seen the rough side of life ever since his father sent him to Kolkata from the back-of-beyond Amroah in Uttar Pradesh as a 16-year-old to try his luck in club cricket. Soon after finishing among the top three wicket-takers of the 2015 World Cup Down Under, Shami broke down with a knee surgery that kept him out for more than six months. The cricket fraternity in the City of Joy, which had been privy to his meteoric rise before the fall last year, couldn’t have been happier at his resurgence. Speaking to Gulf News, former India veteran and Bengal coach Ashok Malhotra — who has mentored Shami in the state team — was pleased as punch. Deep Dasgupta, former Indian wicketkeeper and now a TV pundit, attributes Shami’s current run of form to his improved fitness. “There would always be doubts in the past if he could last an entire Test series, but that seems to be a thing of the past now,” he wrote in his column.